Compared to a few years ago when the kitchen was viewed as a space tucked in the back of the house with just the essentials for preparing meals, a peek at modern kitchens reveals a different concept with the kitchen serving as the functioning hub of the home. As more people adopt open-concept kitchens – where the kitchen functions as an active space of the family home – there is less demand for huge, obtrusive ranges and oversized hoods. Instead, households are viewing their kitchens as a quieter part of the home, with thinner countertops and mixed materials as opposed to large, blocky islands and flashy finishes. One noteworthy emerging kitchen trend – that complements the idea of open-concept kitchens – is the invisible kitchen design, which conceals appliances and tucks away bar areas behind pocket doors, keeping the countertops clear of clutter, and the kitchen feeling more like a part of the overall living space. You expect to walk into a kitchen and see appliances, sinks, dishes, cabinets, and anything else involved in meal preparation out in the open. Invisible kitchens seek to achieve the opposite effect, with nothing on display. The kitchen is designed in such a way that all superfluous elements are removed, leaving only what is absolutely necessary. The water, electrical connections, and cooking elements are incorporated within a small space, so the top surface extends only a few centimetres, while all other appliances and storage space are concealed behind large sliding wall panels. To reduce the stress of trying to locate utensils or cooking accessories in a disorganized kitchen. Organizationalso reduces the chances of spending money replacing items that have been misplaced, and eliminates any mess that would embarrass you in the presence of your guests. Invisible kitchens cost a lot of money to install. They require you to perform major renovation of your kitchen, and such work usually involves electrical and plumbing work. In addition, you may be required to purchase new appliances that economize on space. 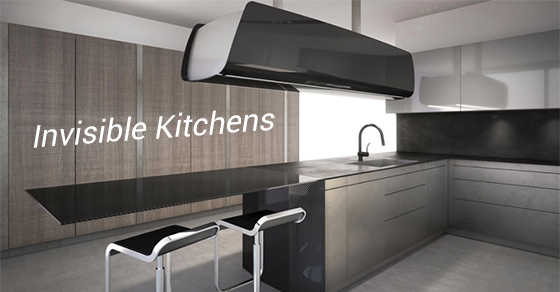 Nevertheless, invisible kitchens are a great addition to any home that hopes to make the kitchen a safer, clutter-free, and organized space, as they merge it with the living space.